The biggest disappointment you can experience once you’ve ordered new uniforms is the dreaded news that they won’t be finished by your big performance date. Avoid this disappointment by carefully planning your project. Planning not only assures that you won’t be disappointed by your delivery date, but you will also impress you administration with your professional approach to the task. Consider the following sequence of events and the amount of time you should allot for each. At this time you and your representative sit down and discuss your needs, desires and preferences. This meeting usually takes approximately two hours and should be scheduled when interruptions will be at a minimum. At the initial design meeting decisions are made that result in the production of a computer color sketch of your uniform. The professional sketch will accurately portray the color combinations selected in your design. Depending on the time of year, this could take from 1 to 3 weeks to generate. After you receive the sketch show it to your administration, boosters, whoever will be involved in the funding and/or decision making. Of course nothing is written in stone and if the design is only loved by you, we scrap that one and start again with the new knowledge we gained from the first sketch. This step will probably take up two weeks of your time. After you have made the necessary changes to the sketch, it is time to order an exact sample of your creation. We will produce a sample for you at no cost or obligation. It is imperative that you see an actual uniform utilizingyour design before you order. The time needed for this step will vary depending on the time of year you make your request, but you should probably allow 3 to 4 weeks. Once you receive your sample put it on a student and view the suit in simulated performance situations. You can’t really evaluate what a uniform will look like on the 50 yard line from row 20 if you only hold it out at arms lengthon a clothes hanger. Likewise you won’t know how effective the garment is on the stage, in a parade or wherever unless you put it on a person and put them in those situations. Allow yourself 2 to 3 weeks to complete this important task. If you are in a situation that requires you solicit bids for your uniform project, you must prepare specificationsto allow a vendor to properly bid your contract. 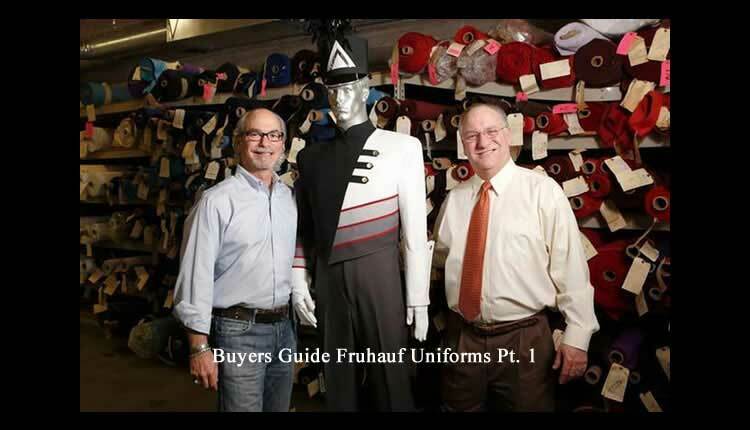 These specifications contain explicit instructions pertaining to when, where and how to submit the bid, and most importantly detailed instructions on how you want your uniform made. Specifications are discussed in more detail later in this booklet but for now consider that this step will take 1 to 2 weeks to complete. Your schools business office can direct you on the bidding procedures used by your district. This step can take anywhere from 2 to 4 weeks to complete. Each vendor is required to submit a sample for evaluation to your school. THIS IS THE MOST CRITICAL STEP IN THE PROCESS. At this point you must determine which vendor will provide your school the quality of uniform you desire. Evaluation is discussed in greater detail later in this booklet, but you should plan on doing your evaluation approximately one week PRIOR to opening your bids. After you have completed your evaluation, you should prepare a written sample evaluation that recommends a vendor, based on quality, for submission to your boosters, administration, School board or whoever is involved in the decision making process. After the evaluation is complete and your report submitted, the bids are opened and the companies pricing is exposed.Based on your evaluation and the pricing submitted, you are now in a position to award the contract. After you have awarded your contract, the successful bidder will send a representative to measure your students and complete the order. Completion of the order involves obtaining your approval of a pilot sample, determining the sizes desired, and finalizing the payment method. Once those three items are received at the factory, your order is placed and the production time schedule begins.